The FTC also alleges that the defendants signed people up for automatic shipment programs without their express consent and billed their credit cards without authorization, in violation of the FTC Act, the Restore Online Shoppers’ Confidence Act (ROSCA), the Electronic Fund Transfer Act (EFTA), and Regulation E. The FTC says the defendants did that both to consumers who were led to believe they were getting a “free trial” and to people who thought they were placing a one-time-only order for a product. Placed either by the defendants or by affiliate marketers working with them, the ads typically featured an eye-catching headline and a photo of a celebrity in a format that looked like news or lifestyle reporting. (Let’s be clear. The celebrities whose names were used had nothing to do with the promotions.) 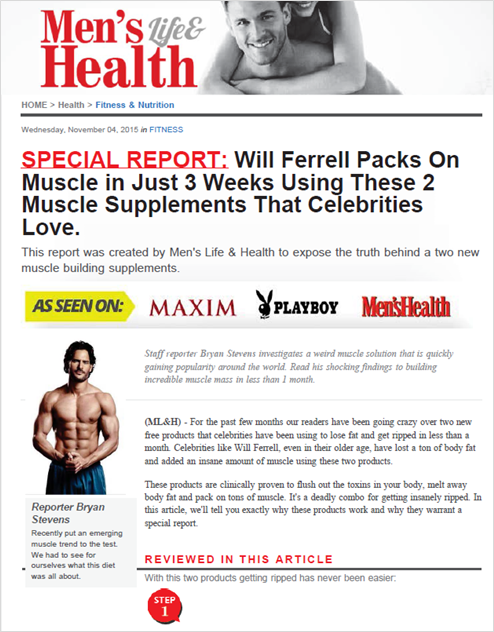 For example, a “special report” for “Men’s Life & Health” claimed that “Will Ferrell Packs On Muscle in Just 3 Weeks Using These 2 Muscle Supplements That Celebrities Love.” The subheading continued, “This report was created by Men’s Life & Health to expose the truth behind a two new muscle building supplements.” In fact, the “report” was an ad for Ripped Muscle X and Elite Test 360, which promised substantial fat loss and muscle gain without any change in diet or exercise. Another promotion – EveryDay with Paula – featured celebrity chef Paula Deen purportedly recounting her experience as a “guinea pig” for a “miracle pill” called Flawless Raspberry Ketone. 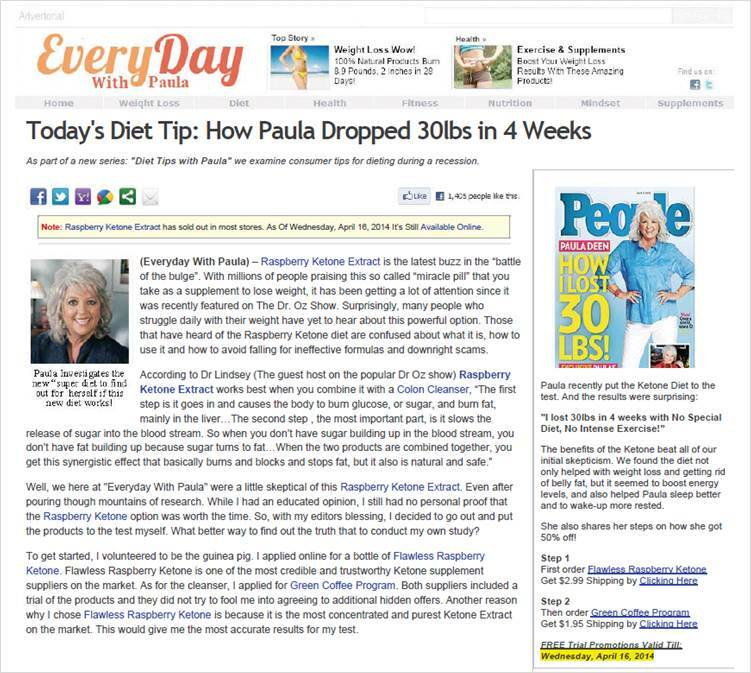 According to the webpage, “I lost 30lbs in 4 weeks with No Special Diet, No Intense Exercise!” But according to the FTC, EveryDay with Paula had no affiliation with Paula Deen and the defendants had no support for their weight loss promises. Even the featured consumer testimonials were false, alleges the FTC. Some of the defendants’ other sites used look-alike URLs such as goodhousekeepingtoday.com or womenshealthi.com, and featured mastheads that the complaint says mimicked Good Housekeeping or Women’s Health magazines. In addition, the sites often used false “as seen on” references to ABC, CBS News, CNN, MSNBC and other media outlets. The defendants or their affiliates sold products through more than 40 variations on this theme. In addition, the complaint alleges that many of those promotions added credit card insult to false advertising injury. The FTC alleges that the defendants buried the fact that consumers would be enrolled in automatic shipment programs in hard-to-find, hard-to-read, and hard-to-understand fine print. In some cases, consumers who bought an item were signed up for a second undisclosed automatic program if, in response to a “Thanks for your order” page, they took the defendants up on a “free” trial of another product. The upshot: more unordered items, more unauthorized charges, and more unrelenting headaches for consumers. Invoking the defendants’ promise of full refunds, consumers complained about the unordered stuff and the unauthorized credit or debit card charges. But according to the FTC, many consumers never received the refunds they requested or got them only after complaining to government agencies, credit card companies, banks, or the Better Business Bureau. The lawsuit names California-based Tarr, Inc., Richard Fowler, Ryan Fowler, Nathan Martinez and three pages of corporate names the defendants used to carry out the practices challenged as illegal. Among other provisions, the settlement imposes a partial ban on future negative option sales and requires the defendants to put detailed monitoring provisions in place to supervise their affiliate networks. Based on their financial condition, the $179 million judgment will be partially suspended when the defendants turn over approximately $6.4 million in cash. The complaint offers a compendium of “don’ts” for online marketers. Here are some compliance nuggets to take from the case. Deceptive fauxmats violate the FTC Act. Decades of cases establish that it’s illegal to deceptively dress up ads to look like independent news, reporting, or programming. Also on the list of practices to avoid: falsely claiming that products are endorsed by celebrities or that they’ve been evaluated by media outlets. Don’t use marketing methods likely to fool consumers – or that try to throw banks, payment processors, and law enforcers off the scent. The defendants sometimes hosted multiple versions of the same promotion. If consumers navigated from an embedded link on another site – the much more likely way people would learn about a product – they were taken to pages where products were offered for sale with what the FTC says were undisclosed automatic shipment programs. But a funny thing happened if you just typed in the URL – for example, rippedmusclex.com. That took you to an entirely different site that included more visible disclosures of the trial offer. Why would a company create those different versions? The complaint suggests that it could have been done in an attempt to have a “clean” version for banks, payment processors, and law enforcers. The “good twin/bad twin” trope may work on 70s sitcoms, but it’s an ill-advised marketing tactic. In determining liability, the FTC considers, among other things, who’s calling the shots. Remember Kramerica Industries, the business venture on “Seinfeld” set up with interns? The defendants here created a labyrinth of corporations nominally headed up by unpaid interns, support staff, and family members. But as the FTC alleges, the defendants used consulting agreements to maintain the control and the cash. It’s unwise for companies to count on a convoluted corporate structure or arcane affiliate arrangements to evade liability. Claims of easy weight loss or effortless muscle mass are likely to attract scrutiny. The complaint alleges that the defendants didn’t have substantiation for their advertising representations and falsely claimed to have scientific studies to back up what they said. In fact, some ads featured what the FTC calls Gut Check claims – presumptively bogus weight loss promises that can’t possibly be true. If you sell diet products, have you subjected your ad copy to a gut check? Review your ROSCA obligations. ROSCA makes it illegal to use online negative options unless you clearly disclose all material terms of the transaction before obtaining consumers’ billing information, get their express informed consent before charging their accounts, and offer a simple way for them to cancel and stop the recurring charges. What’s more, companies offering those “free trial” add-ons after the initial sale should be doubly careful to clearly explain the nature of the deal up front and to keep their mitts off consumers’ accounts without their express agreement to be charged. I am from Canada, and we have a similar problem with fake news marketing a bunch of stuff (including weight-loss products, skin creams, brain-boosting pills, muscle-building supplements, and online casinos). The Competition Bureau (Canadian equivalent of the FTC) says they're trying to stop it, but they aren't. If INTERPOL/FBI teamed up with the RCMP to take away the fake news sites' domain names (like what has been done with fake "Canadian pharmacies", music piracy sites, and Dark Web drug markets), I would be very happy. I am thoroughly confused! If the authorities know who the people are who are running these phony companies, why hasn't it stopped? I see these phony ads every day on the internet.The people responsible should be in jail, how are they any different than Bernie Merdock the ponsey scheme perpetrator? If you see a phony ad, please report it to the FTC at www.FTC.gov/Complaint. The information you give will go into a secure database that the FTC and other law enforcement agencies use for investigations. I wish I knew what product it was so I could stop using it!